Konowal was born in the village of Kutkivtsi, Khmelnytsky oblast, and left for Canada in 1913. He joined the Canadian Expeditionary Force as infantryman. The great warrior was a corporal and received a Victoria Cross for bravery and initiative shown during a battle fought in Lens, France in August 1917. “This non-commissioned officer alone killed at least 16 of the enemy, and during the two days’ actual fighting carried on continuously his good work until severely wounded,” Konowal’s award citation reads. Descendants of the hero live now in Khmelnytsky oblast. His great-granddaughter Valentyna Bortniak admitted: “Konowal never returned to Ukraine. He left his wife and daughter here, and wrote them and sent money home at first. However, the great-grandfather then learned that his family died off during the Holodomor, and the links were broken, with him remarrying in Canada later.” Before leaving his home, Konowal planted a lime tree in Kutkivtsi, which was recently carted off, as the tree rotted away and fell to pieces over the intervening century. 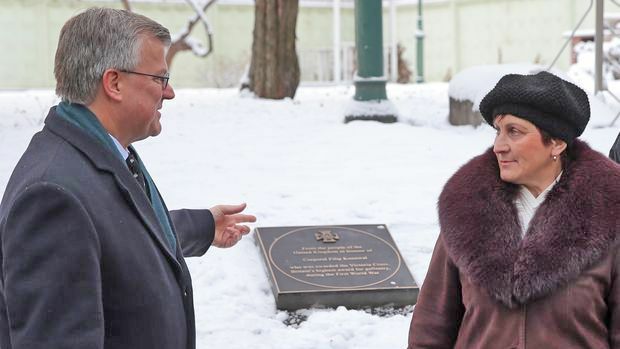 Meanwhile, Canadian Ukrainians opened a monument to Konowal in Kutkivtsi 14 years ago.